Meyis Automotive is one of the leading companies for passenger seat accessories industry based in Bursa - Turkey. We manufacture passenger seat accessories for city service bus, rail, coaches, vans, trolley buses, trams and trains, and continue to lead the industry with our reliability, quality and customer satisfaction. Since its establishment in 1995 Meyis Automotive has operated with continuous development and has gained a positive reputation for its quality and reliability. We provide a complete service starting with design development in R&D department to designing and manufacturing molds and other tools in our in-house mouldshop. Then we create prototypes and İnjection production takes place at our machines, which ranges in size and strength. Quality checks and measures are carried out. Once the high and universally accepted standards have to been reached, we ensure our products are delivered ‘JIT’ to our customers. We work with high technology to produce robust, ergonomic and creative designs using our year’s worth of experience to produce top quality plastic products ranging from armrest, plastic seats, snack trays, footrests, backrests, handles, trim parts, service sets, magazine nets, city bus handle wraps and emergency hammers. Our robotic and automatic production enables us to achieve high precision when manufacturing plastic seat accessories. Our mission is to satisfy customers with both our innovative seating products, and our high quality customer service. Production at Meyis Automotive is based on the IATF 16949:2016 Quality Standard. Meyis Automotive is also an advocate for personal growth of employees and ensures regular training and social activities are carried out to gain the most accomplished and skilled work team. Our consistent growth and short lead time has allowed us to break local market boundaries and reach out to the international market, allowing us to export to over 20 countries. 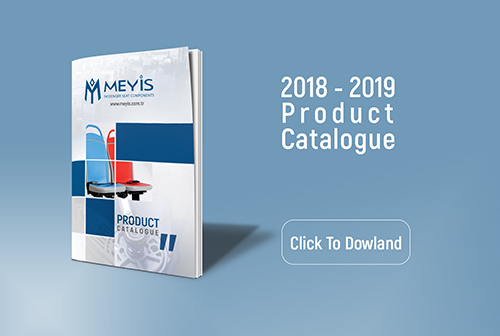 Meyis Automotive aims to maintain its position in the global market by providing high quality products and exceeding customer service to obtain long-term customer relations.